AACHEN, Germany, Oct 7, 2016 – ModuleWorks, the leading supplier of CAD/CAM software components for machining and simulation, and CENIT AG, a leading software and consulting firm, have agreed a partnership to integrate ModuleWorks components into FASTSUITE Edition 2, CENIT’s innovative solution for the digital factory. 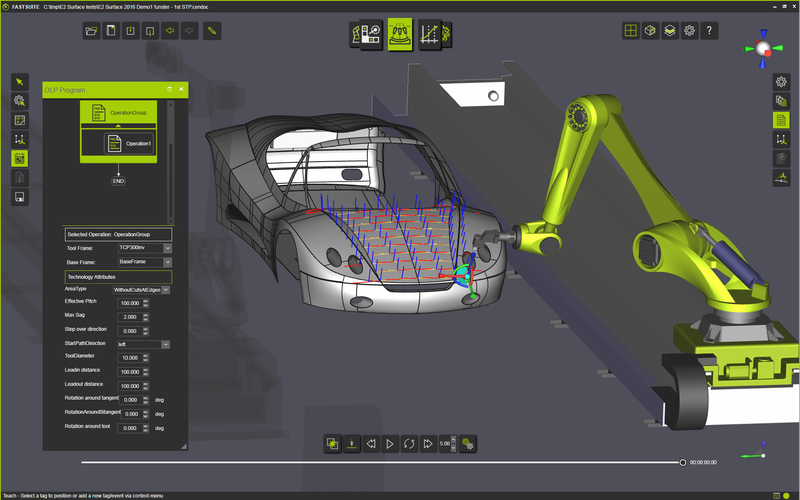 FASTSUITE Edition 2 enables users to create, program, simulate and optimize the production environment.The integrated ModuleWorks components strengthen and advance the robotic and NC machining capabilities of FASTSUITE Edition 2 with industry-leadingmulti-axistoolpath calculation and simulation software as well as a specialized component for Laser Aided Manufacturingapplications.The integration work is ongoing and components for offset roughing have already been integrated into the latest release of FASTSUITE Edition 2. CENIT is your partner for successful digital transformation. With a broad solutions and services portfolio, CENIT enables clients to optimize their horizontal and vertical business processes. Our solutions are based on innovative technologies in: product lifecycle management, the digital factory, and enterprise information management. With interdisciplinary knowledge of the processes involved and their considerable expertise in the field, CENIT consultants provide customers with end-to-end advice to ensure that solutions are implemented with an understanding of the entire value chain. With a holistic approach and based on trusted partnerships, CENIT takes responsibility for solutions on behalf of our clients. From the initial consultation to the introduction of innovative IT solutions, right through to ensuring a cost-effective operation. The CENIT team adapts to each client, taking a practical approach, which enables measurable, operational optimizations. CENIT has been helping prestigious customers in key industries to gain competitive advantages for over 25 years! CENIT has over 700 employees worldwide who work with customers from: automotive, aerospace, industrial equipment, tool and mold manufacturing, financial services, and trade and consumer products industries. For more information, visit www.cenit.com and www.fastsuite.com. ModuleWorks is a software component provider for the CAD/CAM industry. ModuleWorks’ expertise in tool path creation and simulation is recognized throughout the CAM industry and its software components and development services are used by the majority of the leading CAM vendors for sophisticated industry focused solutions across diverse business sectors. The flexible ModuleWorks engines for motion planning and simulation bring the benefits of the proven ModuleWorks core technology to Robotics and NC machining applications. ModuleWorks 5-axis and simulation software has been used in the manufacture of complex parts for over a decade and they have many users across the global CAD/CAM industry. This entry was posted in CAD-CAM-CAE on October 7, 2016 by Sharmila Guha.